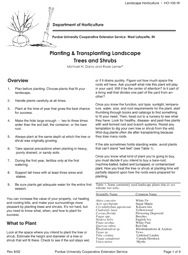 This publication discusses plant selection, timing, preplant operations, planting instructions, pruning, staking and guying, trunk wrapping, watering, and transplanting of landscape trees and shrubs. Tables are provided listing some slow-to-root trees that should be planted in the spring and some commonly used landscape plants that do not tolerate wet soils. Illustrations are also included showing the preferred and acceptable planting times for nursery stock in central Indiana, the proper planting of a bare-root, balled and burlapped, and container-growth plants in well drained soil, construction of a raised bed on poorly drained soil, the proper planting technique for sandy soil, how to stake and wrap a tree, and the two-year sequence for root pruning and third year transplanting of a tree or shrub.